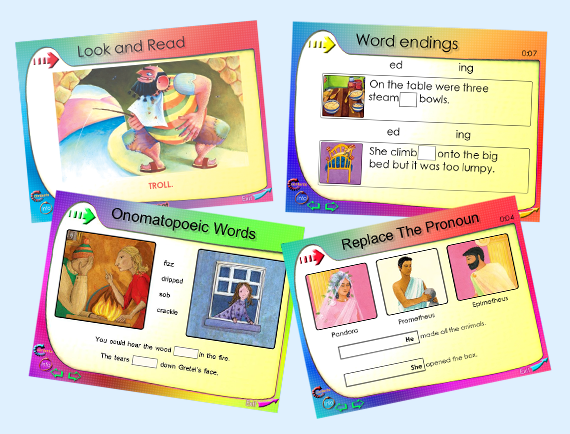 Mantra Lingua's exciting eGrammar tales help all learners to develop strong reading, writing, speaking and listening skills. They are an effective literacy tool for all stages. An excellent aid for EAL children, there are clear instructions of what to do in 16 languages, including: Arabic, Bulgarian, Cantonese, English, French, Farsi, Hungarian, Lithuanian Panjabi, Polish, Portuguese, Russian, Somali, Sylheti, Turkish and Urdu. Taking well known stories as their starting point, pupils can read the Mantra Lingua dual language edition of Ali Baba before completing the activities. The familiarity with the story increases comprehension understanding. Pupils can also explore the story of Ali Baba and the Forty Thieves by watching the video, reading the e-version of the story and then working through the activities. The software can be used by individual pupils on PCs as well as by the whole class on the whiteboard. 1. Grammar: Synonyms, punctuation, find the pronouns, find the noun phase, replace the pronoun and use possessive pronouns. 2. Vocabulary: Look, listen and read the story. Re-word the story, onomatopoeic words, do the crossword and re-write the story. 3. Activities: Complete the jigsaw puzzle. Make a wanted poster using descriptions of the characters. Make your own talking picture book by writing your own version of the story and putting in Richard Holland’s pictures from the story or even adding your own. Then you can print the story and fold it into a mini-book using our special Storyfold™ paper. “… The rich experience. Quite simply, enchanting” Tim Rylands, Junior Education.